Saturday May 11 1907 I felt wretched I did jist what I was obliged to do and was in bed most of the afternoon Will busy about the place most of the forenoon and to town a little while in afternoon. I went to bed early. Sunday May 12 1907 There was a strong wind from the south and a most unpleasant day. I felt able to get the breakfast and did up the work. Will and I had a long talk about buying Mrs [Kovers?] place. Robe Whetstone was here for awhile. It is 21 years today since Will and I were married. I wrote letters all afternoon. I went to bed early. I have such a sore throat and head-ache. Monday May 13 1907 I was busy all forenoon with the work. I did not feel able to go down to the Dr in the afternoon I went down to mail some letters and stopped at Mrs [Kovers?] awhile. 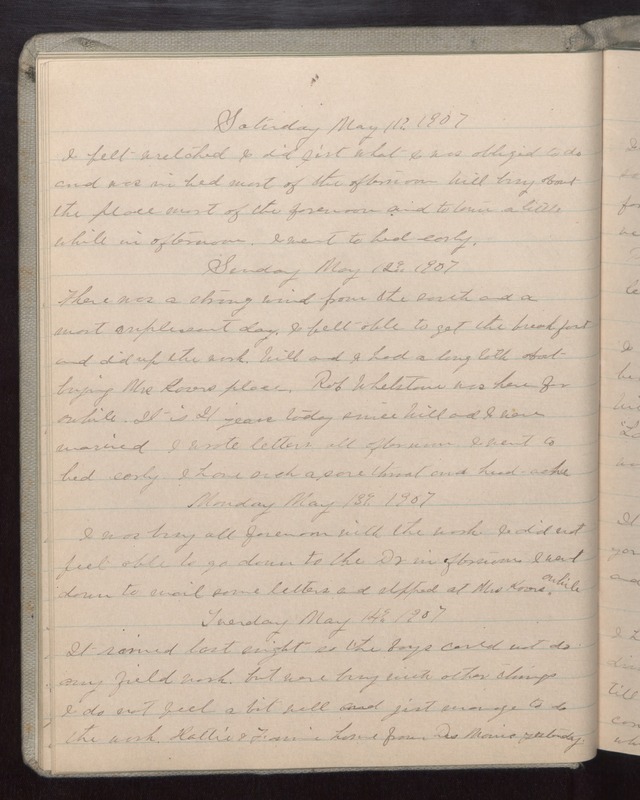 Tuesday May 14 1907 It rained last night so the boys could not do any field work. but were busy with other things I do not feel a bit well and jist [manage?] to do the work. Hattie & Fannie home from Des Moines yesterday.